6 General terms and conditions. 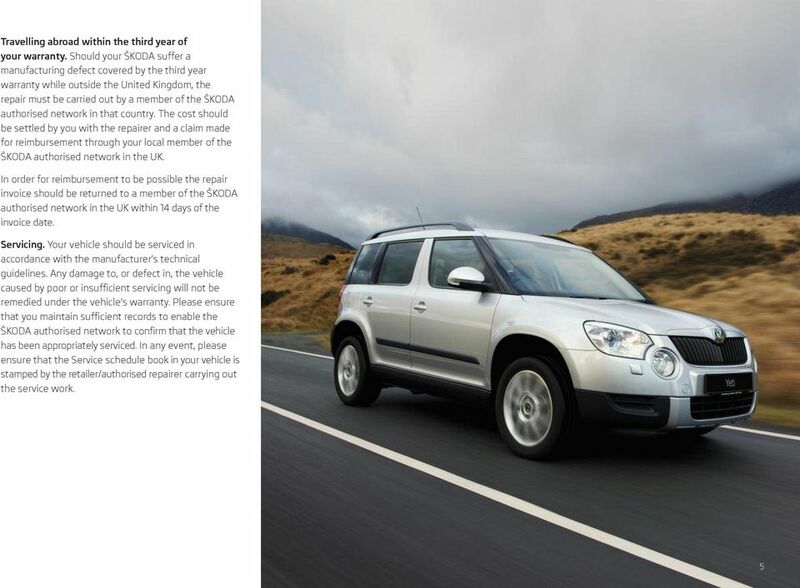 The cover provided shall be subject to the following terms and conditions: > You will complete any forms, give details and furnish any proof required in relation to a claim that ŠKODA or its authorised network may require. > ŠKODA reserves the right to appoint its own or an independent consultant engineer to inspect the vehicle prior to repair or replacement of the part(s) covered. 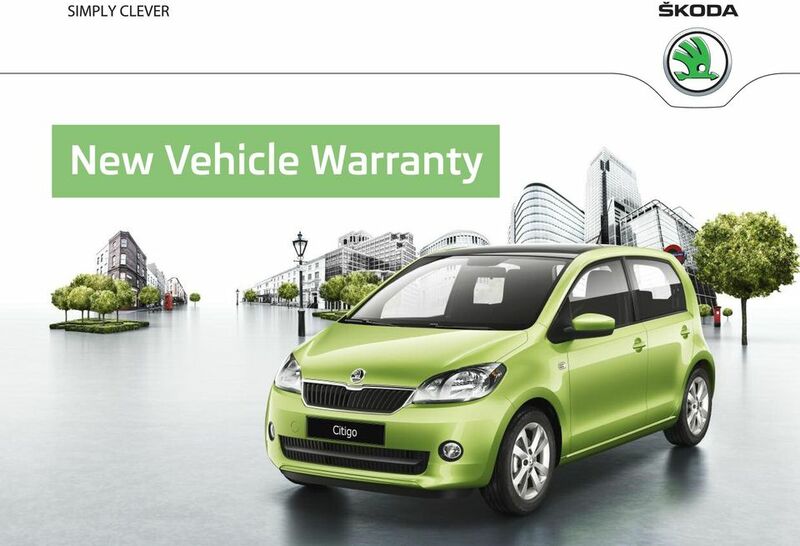 > No party, other than ŠKODA, may amend the terms and conditions of the warranty in any way. Exclusions. Types of damage not covered by the warranty include, but are not limited to: > Damage caused by your failure to take all reasonable steps to prevent mechanical damage from occurring, for example, taking appropriate action in the event of warning lights appearing. > Damage or defects caused by not having the vehicle serviced in accordance with the manufacturer s technical guidelines. > Damage or defects caused by improper use of the vehicle, neglect, or use of the vehicle for motor sports activities. > Damage caused by an accident. > Damage to paintwork or chrome caused by external influences, climatic, thermal, chemical or industrial pollution. > Damage resulting from the use of non-original replacement parts. 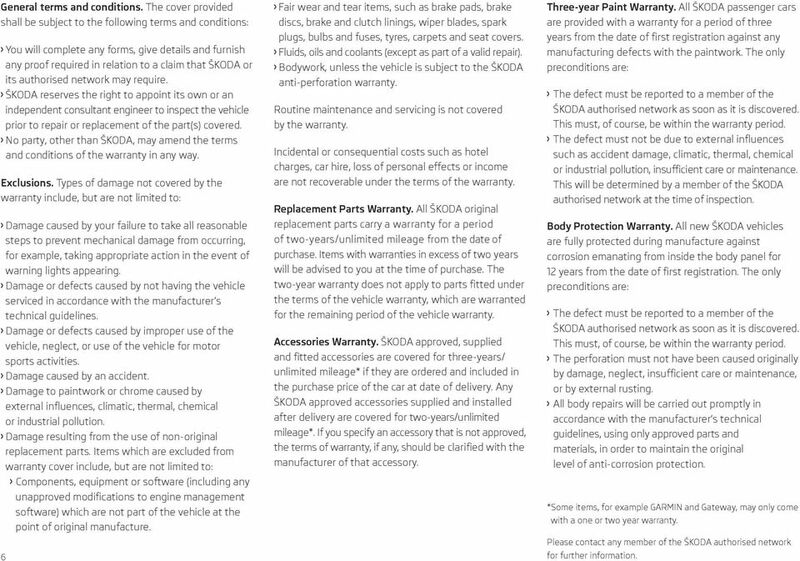 Items which are excluded from warranty cover include, but are not limited to: > Components, equipment or software (including any unapproved modifications to engine management software) which are not part of the vehicle at the point of original manufacture. 6 > Fair wear and tear items, such as brake pads, brake discs, brake and clutch linings, wiper blades, spark plugs, bulbs and fuses, tyres, carpets and seat covers. > Fluids, oils and coolants (except as part of a valid repair). 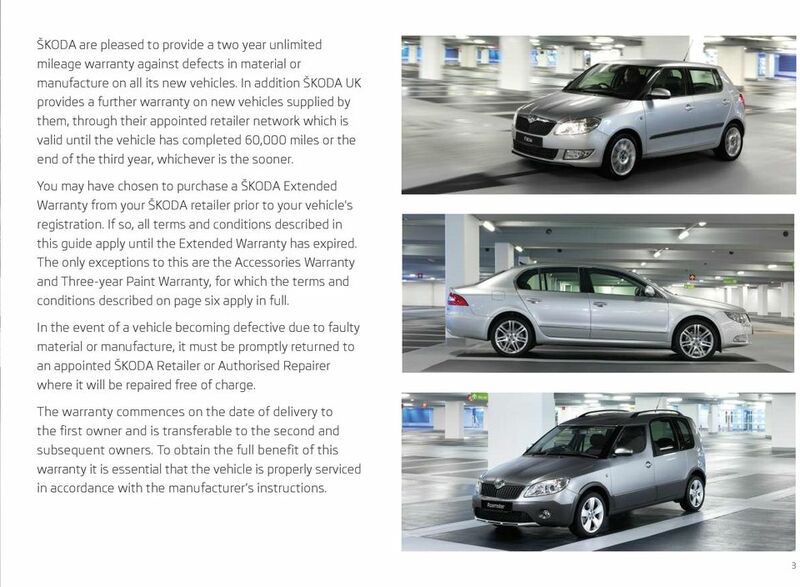 > Bodywork, unless the vehicle is subject to the ŠKODA anti-perforation warranty. Routine maintenance and servicing is not covered by the warranty. Incidental or consequential costs such as hotel charges, car hire, loss of personal effects or income are not recoverable under the terms of the warranty. Replacement Parts Warranty. All ŠKODA original replacement parts carry a warranty for a period of two-years/unlimited mileage from the date of purchase. Items with warranties in excess of two years will be advised to you at the time of purchase. The two-year warranty does not apply to parts fitted under the terms of the vehicle warranty, which are warranted for the remaining period of the vehicle warranty. Accessories Warranty. ŠKODA approved, supplied and fitted accessories are covered for three-years/ unlimited mileage* if they are ordered and included in the purchase price of the car at date of delivery. 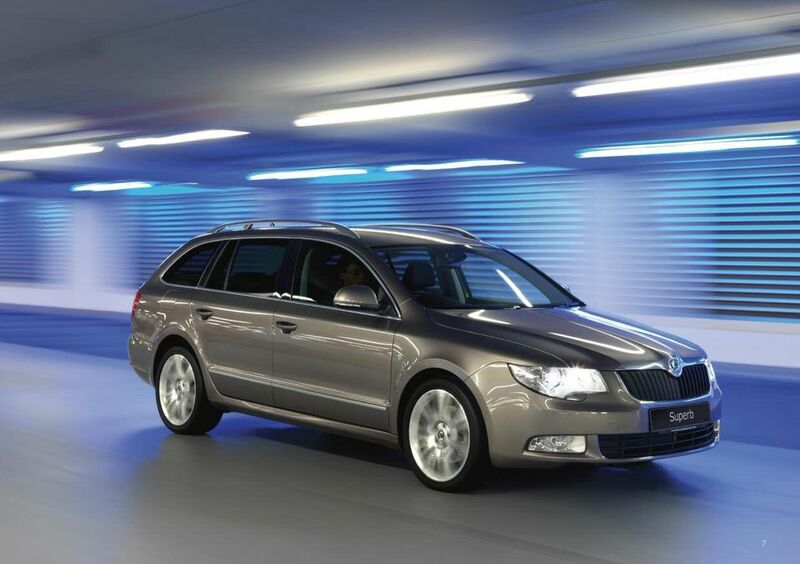 Any ŠKODA approved accessories supplied and installed after delivery are covered for two-years/unlimited mileage*. If you specify an accessory that is not approved, the terms of warranty, if any, should be clarified with the manufacturer of that accessory. Three-year Paint Warranty. All ŠKODA passenger cars are provided with a warranty for a period of three years from the date of first registration against any manufacturing defects with the paintwork. 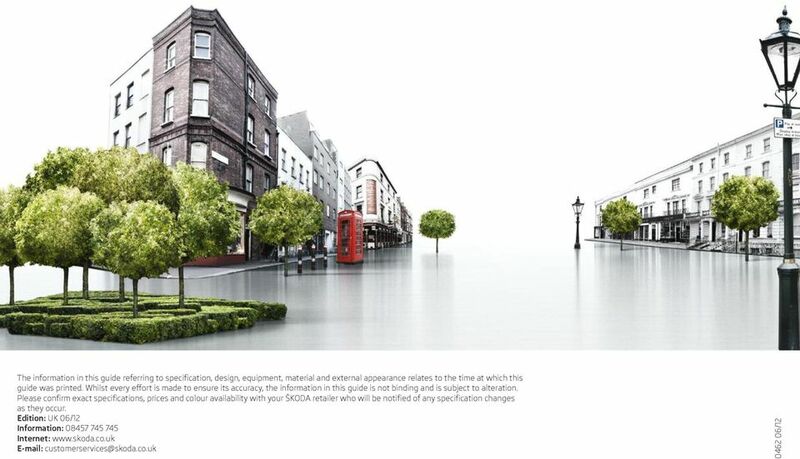 The only preconditions are: > The defect must be reported to a member of the ŠKODA authorised network as soon as it is discovered. This must, of course, be within the warranty period. > The defect must not be due to external influences such as accident damage, climatic, thermal, chemical or industrial pollution, insufficient care or maintenance. 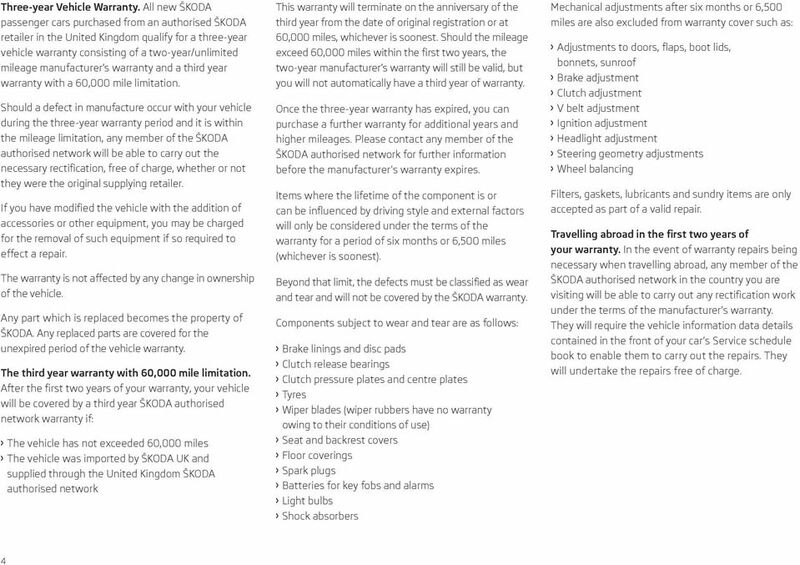 This will be determined by a member of the ŠKODA authorised network at the time of inspection. Body Protection Warranty. All new ŠKODA vehicles are fully protected during manufacture against corrosion emanating from inside the body panel for 12 years from the date of first registration. The only preconditions are: > The defect must be reported to a member of the ŠKODA authorised network as soon as it is discovered. This must, of course, be within the warranty period. > The perforation must not have been caused originally by damage, neglect, insufficient care or maintenance, or by external rusting. > All body repairs will be carried out promptly in accordance with the manufacturer s technical guidelines, using only approved parts and materials, in order to maintain the original level of anti-corrosion protection. *Some items, for example GARMIN and Gateway, may only come with a one or two year warranty. 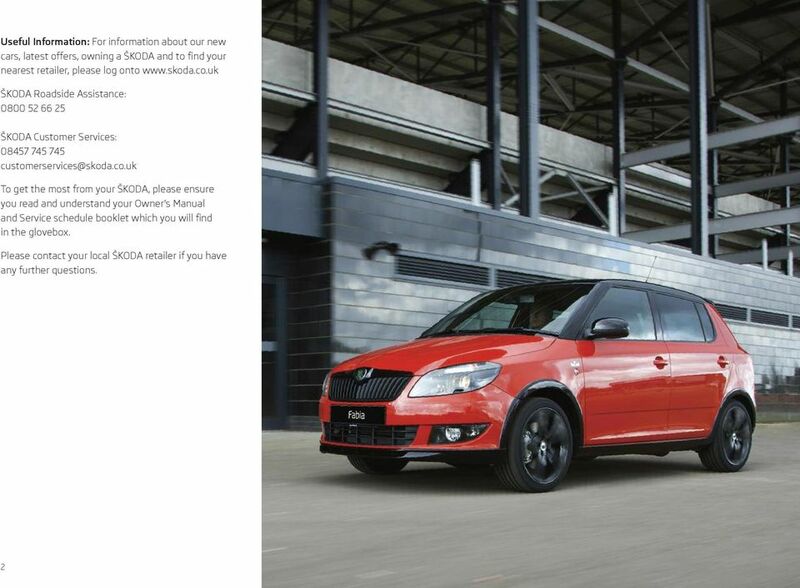 Please contact any member of the ŠKODA authorised network for further information.